Installation Validation | FDA | EU | WHO | Pharma | Med-Device | Bio.. 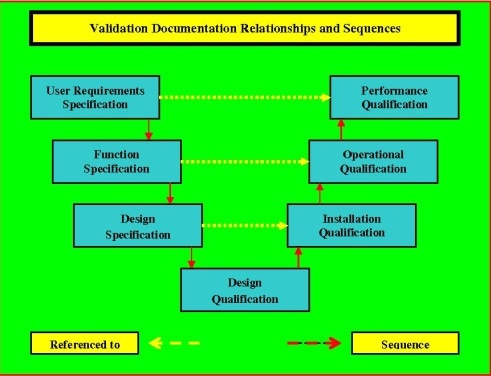 The Installation Validation execution; verifies that the equipment, and its ancillary systems or sub-systems have been installed in accordance with installation validation drawings and or specifications. It further details a list of all the cGMP requirements that are applicable to this particular installation qualification. These requirements must all be satisfied before the IQ can be completed and the qualification process is allowed to progress to the execution of the Operational Qualification (OQ). In the past equipment suppliers have often been delinquent in supplying the right scope and quality of support documentation for their products. As a consequence end user companies have not always had sufficient information (especially in the form of engineering drawings and specifications) about the equipment they have purchased, to develop and put into place the quality of documentation that regulatory requirements demand. For correct and trouble free qualification it is really essential that the scope and quality of the proposed equipment documentation; is specified at the equipment procurement stage. Our Installation Qualification (IQ) protocol comes with an interactive SOP as an attached prefixed document. As you follow the installation validation protocol requirements as specified in the SOP, you complete the actual IQ protocol. This makes it a really easy and straight forward document to use. The IQ is normally a stand alone document, however, with careful pre-planning, certain aspects of the IQ activities can be integrated with the Factory Acceptance Testing (FAT), and the equipment Commission Testing. Conformance with current Good Manufacturing Procedures. (cGMP's) requires, that what ever approach is used, it is fully documented in the individual Validation (Master) Plan (VMP or VP). The IQ should not start with the Factory Acceptance Testing (FAT) or Commissioning tasks, but it should start before these tasks are completed; enabling the validation team to witness and document the final FAT and commissioning testing. The integration of these activities greatly reduces the costly and time consuming replication of unnecessary retesting. For this reason we have modulized the IQ and OQ, building in the tests and inspections that are not in this grey area, and building the one's that are, as modules that can be added to either the IQ or the OQ. This has not been done just because it might work, this has been advocated by us for some time. We have experience major delays to projects, caused purely by waiting for the client to complete document reviews and approvals. See Comment 9 in cGMP-FDA-483. Insert a brief description of what part of the product process ~~..
Verify that electrical installation validation complies with ~~. Identify and verify that serial numbers of all ~~. Verify that the documentation provided by the ~~ .